By Mojahid Khan, School of Law, KIIT University, Odisha. Taxation on income is a vital source of revenue for our government. Although companies have to follow a mind- bogglingly procedure, the list of exemptions and deductions is long. As a result, a lot of companies used these deductions and exemptions and escaped tax liability. While they enjoyed book profits as per their profit and loss accounts (and sometimes even distributed dividends), tax liability as per income tax act was either nil or negative or insignificant. In such case, although the companies were showing book profits and declaring dividends to the shareholders, they were not paying any income tax, these companies are popularly known as zero tax companies. 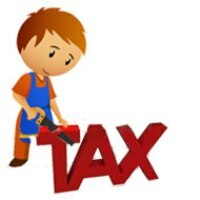 To counter this problem the government came up with the concept of minimum alternate tax (MAT) in the financial year 1997-1998 in order to bring such companies under the income tax act net. The whole concept of Minimum Alternate Tax (MAT) was introduced in the direct tax system to make sure that companies having large profits and declaring substantial dividends to shareholders but not paying tax to the government. By taking advantage of the various incentives and exemptions provided in the income- tax act pay a fixed percentage of book profit as minimum alternate tax. Though there has been a consistent demand from companies from various sectors for its removal, the government continues with this tax. Looking at the proposed provisions of direct tax code (DTC), it appears that the government is very clear that it wants to continue with MAT. Minimum alternate tax @ 18.5% of the book profit of the company computed in accordance with section 115JB. MAT tax liability as worked out under (iv) above would be the tax payable if it is more than the amount of tax worked out (ii) above. Hence tax payable by ABC Ltd. For assessment year 2007- 08 would be ₹ 67.32 lakhs since the tax payable on book profit under section 115JB is higher than the tax payable on computed total income. The provisions of this section shall not apply to the income accrued or arising from 01/04/2005 to 31/03/2012, from any business carried on, or services rendered, by an entrepreneur or a developer, in a unit or special economic zone, as the case may be. It is applicable to all companies except those engaged in infrastructure and power sectors. Income arising from free trade zones, charitable activities, investments by venture capital companies is also excluded from the purview of MAT. However, foreign companies with income sources in India are liable under MAT. The way in which DTC approaches the problem in this respect, one thing is clear that MAT has become a part of life and all of us will have to live with it. There is no point in living in imaginary world and expecting its removal. At the most, there may be some change in the methodology, to which some expectations may be provided. In any case every one will have to sit down and draw new business plan redesign the trade practices and shed the flab. In light of the nature of MAT proposed and the determination of the government of India to modify the same, the only option companies are left with is increasing its taxable income. This can be accomplished by either increasing the rates or prices of goods and services, by reducing wasteful expenditure i.e. expenses which do not add much value to the product or services, or rather by increasing production with the same assets or resources. As can be easily seen, capital intensive companies like steel & construction etc. have long been chronic victims of MAT and have lobbied for its removal ever since its inception. A lot of them are yet to encounter a period that where they haven’t had to pay MAT. And considering the MAT credit can be carried forward only for a period of ten assessment years at a time, it has led to capital erosion on account of MAT. It is another instance of short- sightedness on the part of the government; and one among many measures which cripple our global competitiveness for short- term revenue collection. Previous ArticleInternship Opportunity at Kaleeswaram Raj & Associates, Kochi, Kerala. Next Article CLAT 2014 – Last date for applications is 31st March 2014!! Apply online!